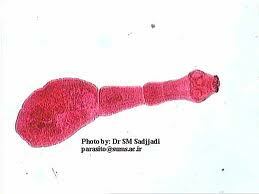 Echinococcus granulosus is one of the smallest tape worms. it causes unilocular hydatid cyst in man. Shape: small, segmented and tape like. Echinococcus granulosus is consist of 3 segments. 1st segment is immature and contains no genital organs. 2nd segment is mature and contains testes and ovaries, and the sacculated uterus lie laterally. The 3rd segment is mature and sacculated uterus is filled with eggs hence it is the gravid segment. coverings: outer covering is consist of a transparent shell, it may be absent but when present, it causes the eggs to clump together. the inner covering is known as embryophore, it is brown in color, thick walled and radially striated. The egg contains an oncosphere (14-20 micrometer in diameter) with 3 pairs of hooklets. it represents the structure of scolex of future adult worm that remains invaginated within a vesicular body. this is found within hydatid cyst which develop inside the intermediate host. eggs are passed out with the feces of definitive host. these are swallowed by intermediate hosts during grazing. in the small intestine of intermediate host, oncospheres (embryo) are liberated with the rupture of embryophore (inner covering of egg). about 8 hours after ingestion, oncosphere bore their way through the intestinal wall and enter the portal circulation and reach liver, where they may settle and form hydatid cyst or they may enter into to systemic circulation and lodge in various organs. From the inner surface of the cyst number of brood capsule develop which contain thousands of protoscolices. Hydatid cyst may rupture releasing protoscolices with invaginated heads into the sorrounding tissure. A fully developed protoscolex is infective to definitive host. when a definitive host (dog, fox, jackal, wolf etc) eats an infected liver of a dead sheep it becomes infected with the organism. in the GIT scolex head evaginates and attach to gut wall by means of its suckers, it grows into adult worm in about 6-7 weeks and start producing eggs. 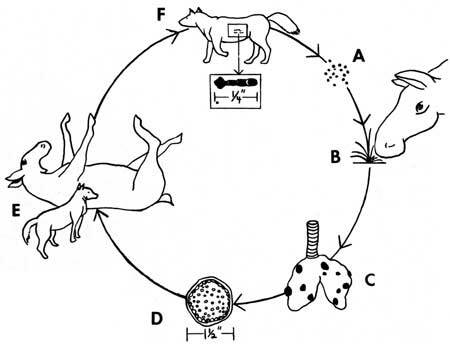 Eggs are passed in feces, thereby repeating the cycle. Human are dead end host because dogs have no access to the meat of infected human. and lay eggs which pass out with feces. Hydatid cyst, pathogenesis, diagnosis and treatment.